There is bucket loads out there in Internet Land on what one should buy and how one should configure a new iMac for photography. I’m going to (try to) briefly list my purchase choices, just in case it helps anyone else in their thought process. Cos that is the thing at the moment, the choices are odd, close together and confusing. First, the model tier. I bought as much computer as I could afford, on the theory that this, to some degree, future proofs you. My Mac Mini just could not cope with what I was asking of it. It is a 2009 model – under powered at its time of conception, let alone now. Yet it still does remarkably well, considering its age and poor specs. For normal, non photographic use, it is still totally fine. Expanding on this, I figure a muscly, top of the line model computer from Apple should freaking well last for year and years. And then years and years more. So, this means I got the the 3.3GHz model. The big(ish) advantages this gives over the middle tier model are (slightly) faster processing (important for photo apps, which depend, for most tasks, on processor speed rather than multi core processing), and a better graphics card (see below). Also, some upgrades work out cheaper when done on the top tier model. The i7 core CPU would have been nice, but only for the faster clock speed. In the end it came down to budget constraints and the realisation that second from the absolute top is still great. More under the photo. 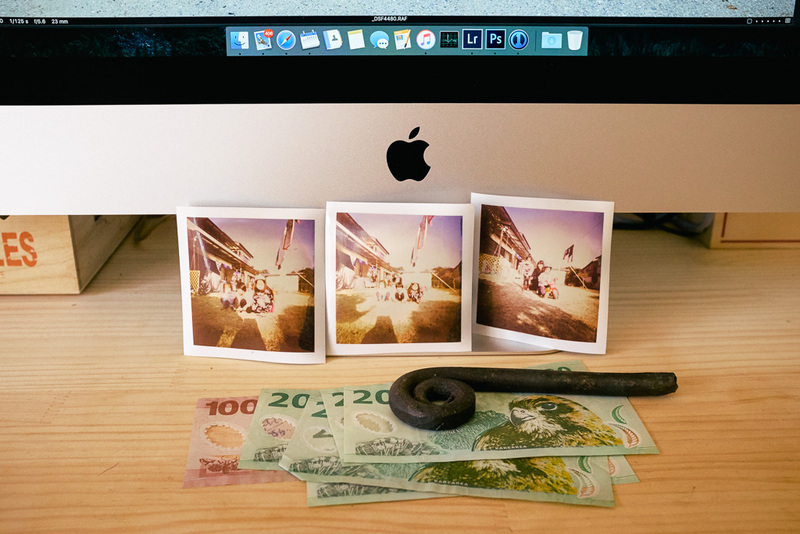 Digital vs. analogue: iMac, instant film, money and hand forged paper weight. Second, internal storage. Many debate whether pure SSD is ‘user noticeable’ faster than Apple’s Fusion Drive in real world situations. This debate doesn’t seem to apply to photography though. Ctein, a word class printer and general all round clever guy, opines in The Online Photographer that for reasons related to scratch disk use Fusion Drives might not be best for Photoshop use, basically on the grounds that in this case they may end up operating essentially the same as a conventional internal drive and thus it is not so much that you gain no advantage, but you actually could lose out big time. Whereas with pure SSD you do gain advantages. Also, the top option of Fusion Drive is 3TB. I already have more than that in photo files, so I would still need my current external drives. Thus, I went with SSD internal storage. I got the 512GB option. I just couldn’t afford the 1TB option, and working out my app, Capture One and Lightroom catalogues and document needs, I dont even come near half the 512GB yet. So, should be fine. Third, RAM. The smart choice is to always get the base amount. Apple just charges too much for memory upgrades [NOTE: you must check to make sure this is / remains a user upgrade before making a choice – some models are not user upgradable now and things may change in the future]. Like many, I got mine from Other World Computing, aka OWC. Not only cheap, but high end matched and tested pairs. I went with their 32GB set. Combined with the standard 8GB, this gives me a total of 40GB of RAM. That is more than heaps enough for now. In fact, it is insanely huge – the Activity Monitor shows basically a tiny green strip at the very bottom of the scale now. When it was just 8GB, it would often peak into the red zone. There may well come a day, many years hence, when 64GB will be needed. If so I’ll get it then, when it will be cheaper. Incidentally, this extra memory seems to have had a noticeable difference. Things are, I feel, faster now. I think (but I’m not totally sure) with the extra memory, Photoshop (which I have set to use 75% of RAM) doesn’t need to use scratch memory and also the CPU seems to be getting fuller use now, being free to use all it’s potential. Forth, the graphics card. Many people, probably quite rightly, point out driving a 27 inch 5K screen takes a bucket load of graphics power. Many reviewers seem to feel Apple has sold these iMacs short on the graphics cards. So, the logical choice seems to be to get the R9 M395X 4GB memory upgrade. However, on closer research, it seems that most people who are complaining are doing so either based on ‘theory,’ or about rendering video files and playing demanding top tier games. So, I went with the standard R9 M395 with 2GB memory. I figure, it is already better than the lower two tiers (which probably do fine anyway), and, like the i5 vs i7 core debate, second best is still pretty freaking good. Fifth, the Magic Trackpad 2. Didn’t bother. The price of this is quite substantial and not worth it since I already have the original Magic Trackpad (which is great & I use constantly). On the other hand, if you don’t already have one, I would recommend the purchase, when funds permit. Last, Apple Care. Got this. Idiot if you don’t. There is a huge difference between one year and three. Also, unless you really are totally ham-stringed by your immediate budget, don’t put it of thinking you will get it before the first year is out. I did this once with an iPod, only to forget and then have the Home Button go out around 14 months after purchase. Grrr at myself. End thoughts, what would I do different? Probably not much. I think if I had a little extra money I might have gone with the better graphics card, or with the i7 CPU (just for the extra speed). I confess to still being slightly worried about the GPU. For example, in Lightroom, disabling graphics processor acceleration seems to help speed things up. With it turned on, brushes would sometimes hang and things would sometimes freeze. However, this may be more of a problem with Lightroom than the graphics card, as some mention it as a ‘known Lightroom issue.’ With Photoshop for example, I have the GPU turned on (defaulting to “Basic” I note) and everything seems fine. I don’t really know. It would be interesting to know what happens in iMacs with the better graphics card – do they also need graphics acceleration turned off in Lightroom? You would need to know this before making a budget based decision between adding the top CPU or the top GPU. So, that’s it, my reasoning. Hopefully some may find it of help. This entry was posted in Photography and tagged 27 inch, 5K Retina, Apple, Apple Mac, Buying, iMac, Lightroom, Photoshop, Purchase, Review by Tokyo Portrait. Bookmark the permalink.